BTZS meets the iPhone. It's the perfect match of Phil Davis' BTZS with the same device that the rest of my life is on. 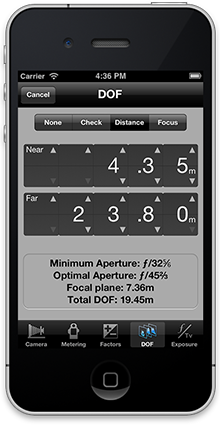 No more carrying multiple gizmos around with me to calculate my exposures and development times. I'm loving it. 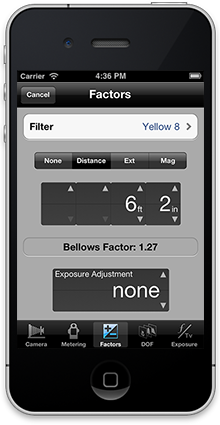 Powerful, comprehensive, and a snap to use in the field, the ExpoDev App multiplied my confidence that I’d get the optimum negative under the most dire of conditions. 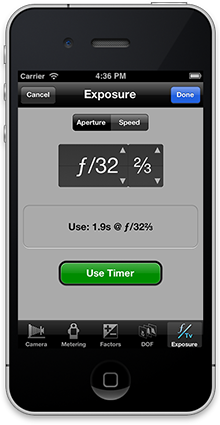 ... a tool that spells liberation for the traditional film photographer. 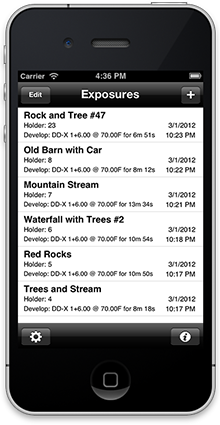 ExpoDev is truly a remarkable tool to have in the field... It has liberated me from having to worry about my negatives, so that I can direct my attention to the important process of making a photograph. BTZS Expo/Dev App is a great tool... for the price of a lunch and a couple of days of film testing you can have perfect exposures every time. BTZS is a godsend and a no brainer for any serious large format photographer. 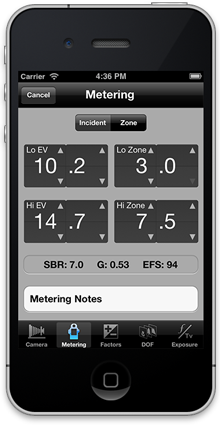 BTZS ExpoDev is the newest generation of ExpoDev for Apple iOS devices. 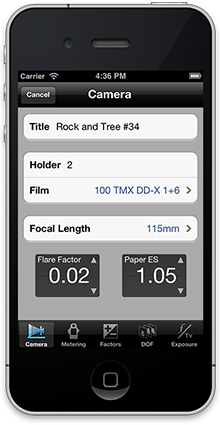 As a companion app for BTZS Plotter, ExpoDev allows you to use your BTZS Film Profiles to accurately calculate B&W film exposures in the field for consistently exposed negatives that are easier to print in the darkroom. ExpoDev was designed for Large Format film photographers working in any traditional or alternative process (including hybrid processes such as film scanning/digital printing). Please visit ViewCameraStore.com for information on their BTZS Film Testing services.